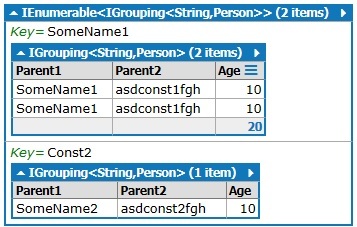 In this challenge let us explore LINQ GroupBy based on multiple properties. The problem is to Group By Property1 if it matches certain condition or Property2 and collect a meaningful key for each row. As earlier, I use LinqPad to get the code working quickly. The crux of the problem lies in the method GetKey which returns a meaningful key for each row based on either Parent1 or Parent2.